Note: This post originally appeared on BetaKit. It has been reposted here with permission. The room was overflowing at MaRS Discovery District this week for the third monthly Wearable Wednesday meetup, where startups in the wearable space meet and drink beer with enthusiasts interested in the technology. The focus during the session was primarily on wearables in the healthcare space, with Canadian companies like OmSignal representing the myriad verticals companies from across the country are tackling. With the burgeoning wearable space on the minds of many consumers, it’s easy to think that such a focus on health is primarily driven by big-name companies like Fitbit, Jawbone, Nike and Samsung, each of which offers a step-counting, sleep-measuring solution for individuals looking to keep ahead of their decline. But what this Wearable Wednesday — during which it was announced that the program is changing its name to We Are Wearables — proved is that it’s the deeper health startups, those focusing on the medical industry, the injured and disabled, that will affect the most change. Going back to OmSignal, the company was represented during a fantastic panel on wearables and health. A companion piece to a whitepaper released by MaRS Market Insights earlier in the week, the panel had Code Cubitt, Managing Director of Mistral Venture Partner, along with Isabel Pederson, Canada Research Chair in Digital Life, Media and Culture, and Jesse Slade Shantz, Chief Medical Officer of OMSignal discussing the current state of wearables in the space. OMsignal, for instance, have developed a bio-sensing shirt that “helps users become their best and healthiest selves.” The shirt can assist in tracking heart rate, breathing, steps taken, calories burned and relaxation/stress levels. That, according to Slade Shantz, is the next logical step for health wearables: coalescing the immense amount of data into usable fragments that can help not only individuals make informed decisions, but general physicians make more accurate diagnoses. 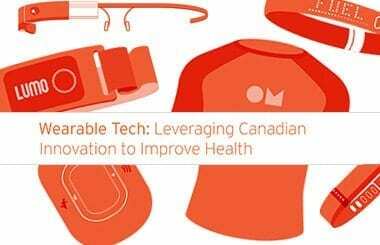 The free MaRS report, titled “Wearable Tech: Leveraging Canadian Innovation to Improve Health,” recalls the lengthy history of the “wearable” as we know it, tracing the origins back to the calculator watches of the 70′s to Steve Mann’s strange and brilliant head-mounted display computer from the 1980′s. As sensors have gotten cheaper and more accurate, and transmission technologies like Bluetooth and WiFi consuming far less power, the proliferation of wearables can be seen as more than just an evolution of the smartphone age. While the majority of wearables co-exist with the computer in one’s pocket — a smartwatch, for example, does not make calls — many of the health-focused products being developed today are being created with specialists and professionals in mind. The report gives the example of a surgeon using Google Glass to mirror his field of view to others in the hospital, but Canadian companies like PUSH are building a band for trainers and their coaches to compete with greater strength — and greater safety. There is no doubt that the market for wearables is only going in one direction; the report points out that by 2018, global revenue for the space could exceed $30 billion, up from an estimated $9.2 billion in 2014. Increased investment from venture firms could also accelerate hardware startups with good ideas that would have never been noticed five years ago. A company that attended Wearable Wednesday, Sensimat, is using Indiegogo to crowdfund a quantified seat for wheelchair users, used to discretely notify those with disabilities and their caregivers when to move in order to prevent bedsores. The report concludes that a successful wearable product in the future will provide better guidance by utilizing the shared data of thousands or millions of people, and will create platforms for developers to build on. They will take not one, but dozens, of measurements from their users, from heart rate to blood pressure to stress levels, and will make intelligent conclusions that help doctors make better decisions. And as with any industry reaching maturity, the wearable market will consolidate, with a few big players coming out on top. While that may be the case, it’s clear, at least from spending a few hours at MaRS this week, that many of those big players will come from Canada.